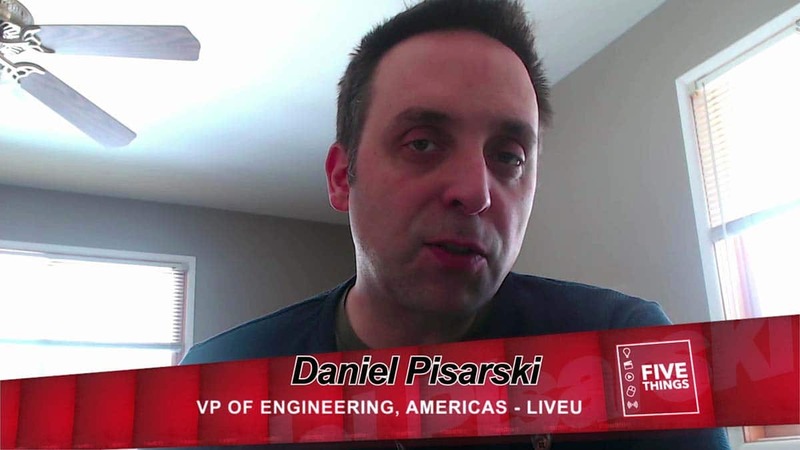 In this episode, we’re going to dive deep into live streaming. Sure your phone can do it, but if you want a professional live stream to YouTube or Facebook or just about anywhere else, then this episode is for you. 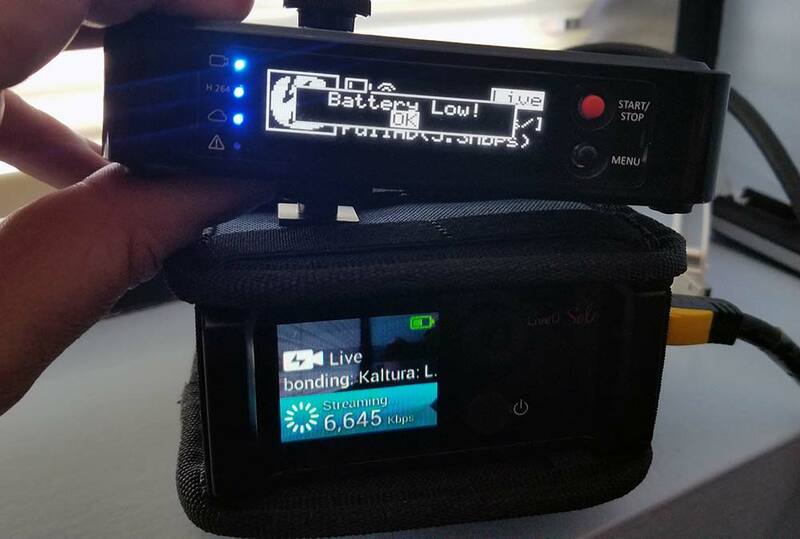 My friends at LiveU asked me to do a deep dive on their Solo streaming device. I suggested, “why not a shootout between the LiveU Solo and the Teradek VidiU Pro?” – (which is another similar device). So, is that cool with you, LiveU? 1. What do they do? Both units have a ton of similarities; so let’s get those out of the way first so we can focus on the ooey gooey differences. At the core of both units is the ability to take an SD or HD video source, usually, HDMI, encode the signal, and stream it out to the web to sites like YouTube or Facebook. This can be via a traditional Ethernet Internet connection, going mobile with Wi-Fi, or even streaming via a USB cellular 3G/4G connection. Both The LiveU Solo and VidiU Pro have the ability to bond across a number of onboard connections, which gives you the ability to have an added level of not only redundancy but also throughput, to ensure your signal is getting out smoothly and at the highest bandwidth possible. Both units, however, charge extra for this feature, which I’ll get into that later. Both units can take AC power, run on an internal battery, are small in size, and both weigh under a pound (although the VidiU Pro is less than half of that) and they easily mount on your camera or attach to your Batman utility belt. The units also have built-in batteries so you can stream for several hours before having to re-charge. Both models also have a webpage backends to control the units…. to varying degrees. The Solo and VidiU Pro both do their jobs very well. But the devil is certainly in the details, and that’s what we’re going to tackle next. The LiveU and Teradek units both allow setup via a web browser on your computer or mobile device. LiveU, via the LiveU Portal and Teradek via the web server on the unit. LiveU is pretty straightforward. 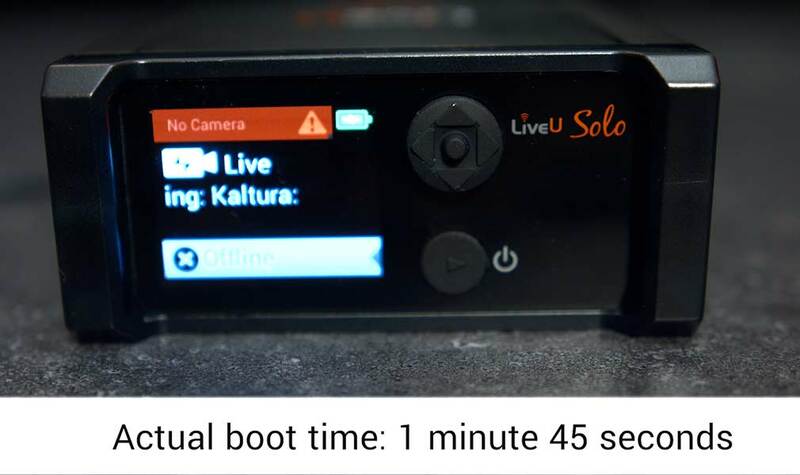 Create an account at http://solo.liveu.tv/, boot up your LiveU Solo unit (although this may take a while) and connect your Solo to the internet. Then, enter in your Solo serial number into the portal, and you’re off and running. You now can do your entire streaming configuration of the Solo signal on the webpage for your unit. Now, this is a blessing and a curse…which I’ll get into a bit later on. Teradek’s setup is very similar. Boot up the unit (which doesn’t take as long as LiveU), and get your unit on your local network – it doesn’t even have to access the internet at this point. It just needs an IP address so your local computers or Wi-Fi enabled cellular devices can see it. 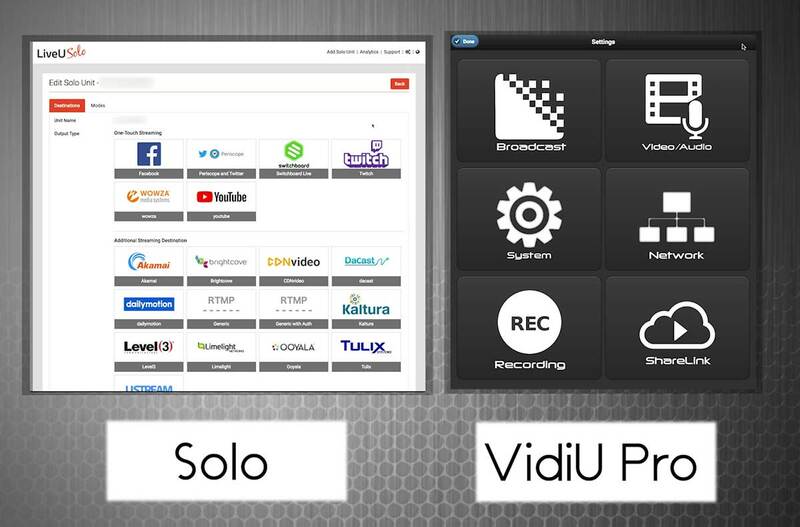 Unlike the Solo, the VidiU Pro has a web server built in, which makes configuration a bit easier. Having a local web server built in means I don’t need to have Internet connectivity on my laptop or workstation if I’m out in the field and want to configure the unit. Yes, I know, you can use cellular devices like your phone to configure their unit, but if cellular service on location is lacking for your phone’s carrier, now what? It’s a slight issue, but I think having a web server built into the unit as Teradek does makes for an easier way of local configuration. Speaking of cellular connections, at this point, if you’re planning on going into the great wide open and streaming via 4G connections, make sure you’ve purchased your cellular modems and chosen the right data plan – one that won’t throttle your bandwidth or cut you off at the knees during an event. Now it’s time for the speeds and feeds and goes in and goes out part of our review. For that, LiveU has the upper hand. With 2 USB ports, the Solo offers an extra layer of USB connectivity. Normally this would be used for 4G cellular modems, which means you can bond across 4G connections and across multiple carriers for a smoother streaming experience. 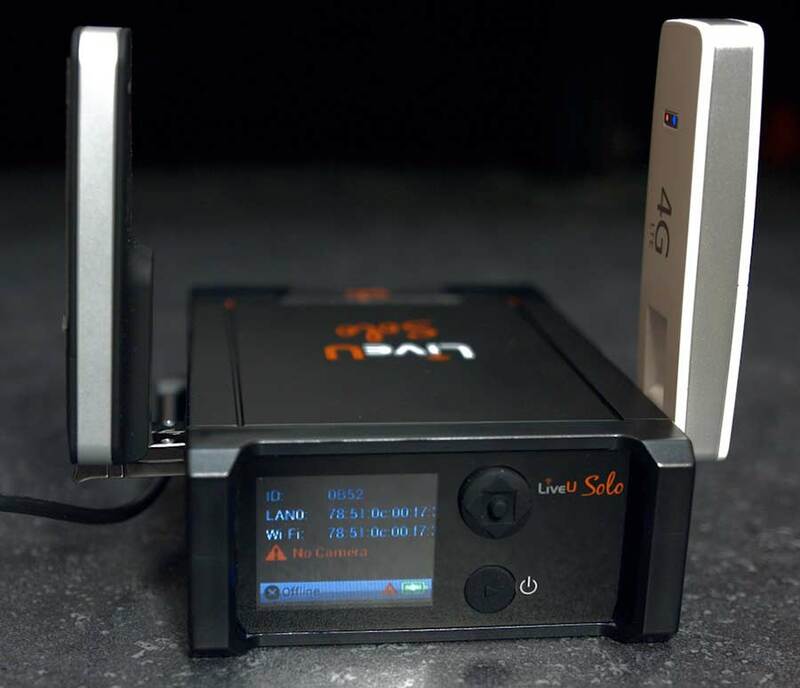 The LiveU Solo has 2 USB ports for 3G/4G cellular modems, compared to the Teradek VidiU Pro’s 1 USB port. Plus, while the Solo itself is HDMI, LiveU does offer an SDI model for a bit of a bump in price…. so those of you with pro cameras don’t need to have another converter with you in your bag of tricks. What Teradek VidiU Pro lacks in a 2nd USB connection it kind of makes up for in onboard recording. The Teradek unit can handle an SD or SDHC card so you can record a local copy of your incoming signal. This comes in handy if you plan to do a cut down later. There is also a major difference in the way audio is handled. The VidiU Pro has an 1/8” audio input – maybe you’re pumping in a mic or music from another source. There is also an 1/8” jack for headphones as well. The Solo also has only one 1/8” jack – and right now, it’s inactive, designed for future expansion. This is where comparisons get tricky because this is where we begin to see the sweet spots for each unit. LiveU has many more built-in CDNs presets – CDNs, or content delivery networks –are the endpoints you would broadcast to in order make your content viewable by everyone in the world, like YouTube or Facebook. The Solo has twice the amount of optimized and tweaked presets out of the box than the VidiU Pro. However, both units do allow for generic RTMP, or Real Time Messaging Protocol – which is a rather generic way of streaming online) inputs so you can manually create presets for just about any online outlet with a minimal headache. Both devices have configuration panels on the unit via joysticks, but far and away, the Teradek unit has more editable info available via the front panel than the Solo does. I really like the small color preview window on the LiveU Solo, however. The preview window on the Solo gives me a bit more confidence that I’m sending out the right signal….and if it’s right from the camera, I can verify there are none of those pesky overlays on the image! The flip side is that I can’t test the Solo’s streaming functionality without a valid input signal. This makes the Solo a bit difficult to test if the other parts of your streaming rig, like the camera or the switcher, are not already set up. I’d love a built-in bars and tone generator with the streaming specs overlaid over the signal for this purpose. Now, when streaming, battery life is of concern. The Solo boasts a 2-hour battery, while the Teradek boasts 3 hours. I tested this out by setting both units to their max bitrate and resolution, and streamed over Wi-Fi to the same CDN until their batteries died. My testing showed that the VidU Pro was nowhere close to the proclaimed 3 hours of battery life, failing at 108 minutes – not even making it to two hours. To be fair, the VidiU Pro results may be slightly skewed as the unit inexplicably stopped streaming 4 times during the test for no apparent reason, which I had to then restart its stream. By comparison, the LiveU had more than 50% of its battery remaining when the VidiUPro died, and continued streaming for another 100 minutes after….with no drop-outs. The LiveU Solo has 2x as much battery life as the Teradek VidiU Pro. I did find I had more flexibility with the LiveU as I can override the units presets and manually specify the data rate; the VidiU Pro forced me into one of several presets. The Solo also gives me a max data rate of 5.5Mbits, whereas the VidiU Pro tops out at 5Mbps. Quite honestly, I don’t see most folks noticing this visually unless you’re really pushing the limits of the 1080p60. Another point on 1080p60: This is VERY important for sports, both live and eGaming based, and other content where you want the largest frame size and frame rate possible. The VidiU Pro tops out at 1080p30, and only reaches 60 frames at a 720p resolution. If your endpoint is demanding 1080p60, then LiveU is gonna be your first choice. 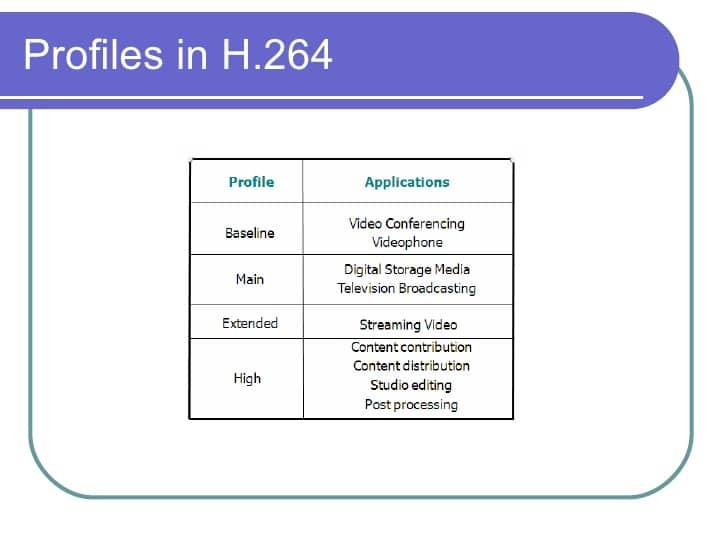 The Solo also encodes in an h.264 High profile, while the VidiU Pro simply supports Main profile. This means more efficient compression that should manifest in better visual quality at lower data rates. It’s also the profile that’s traditionally used for larger screen HD monitors while Main profile is generally reserved for smaller screens and less powerful devices, like tablets and smartphones. LiveU takes a staggered approach to streaming: the data rate starts low and climbs to the intended (or available) data rate, usually within 60 seconds or so. This can be problematic for those who are running and gunning and need to go live instantaneously. I see it as a safeguard to have a stream start smoothly while buffering. You can certainly work around this by starting a stream, but not going live on your CDN until you hit your desired data rate. VidiU Pro, by comparison, starts at the desired bitrate as soon as you start streaming. 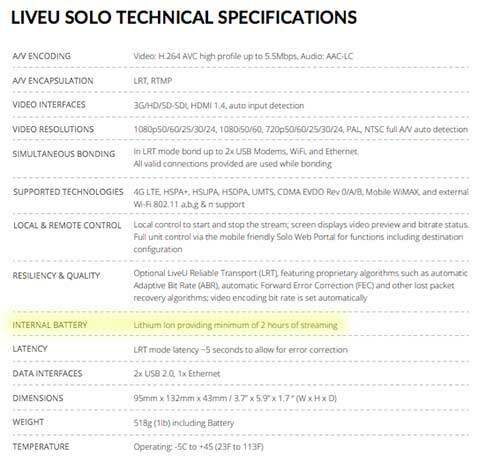 LiveU also a cool tech called LRT, or LiveU Reliable Transport– a tech that they actually hold the patent on. This includes forward error correcting, packet ordering (which is mandatory when bonding across multiple signals), and adaptive bitrate encoding. It’s the adaptive part I like because the audio is always made to maintain a higher priority of quality to video, so even if the bandwidth drops, the audio quality will remain good. 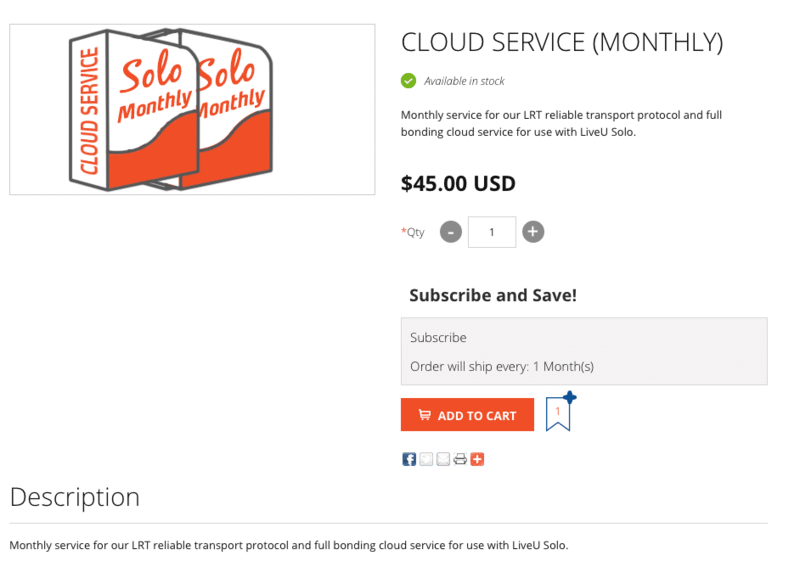 Keep in mind, utilizing LRT on the Solo is an extra $45/month charge. 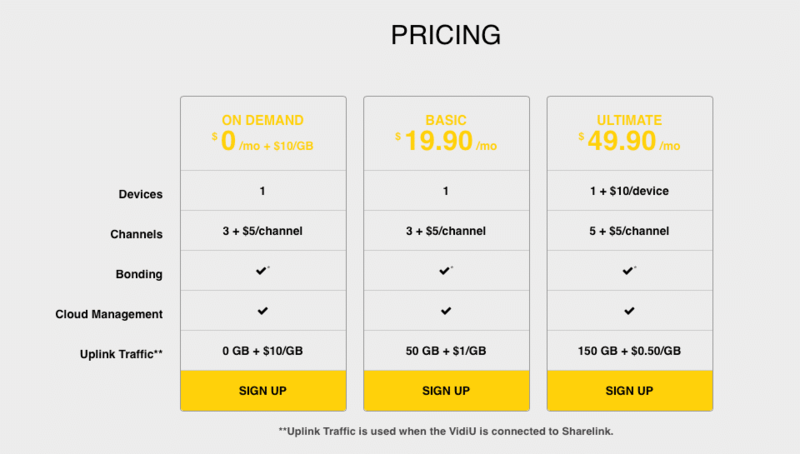 But then again, Sharelink from Teradek, which also provides bonding across connection methods, is also an upcharge per month, depending on your bandwidth needs. Now, in terms of streaming reliability during my testing, the VidiU Pro stopped streaming for unknown reasons a handful of times, four in fact, during a nearly two-hour stream test – while the Solo never stopped streaming until I told the unit to do so. The Teradek VidiU Pro stream was interrupted multiple times for no apparent reason, while the LiveU next to it ran without any issue. I was able to replicate this behavior during other shorter tests as well. I wish when the VidiU Pro ran into a streaming issue, it would try and correct itself…better? Whenever the stream was interrupted, I had to manually restart the stream on the Teradek unit. It’s obvious both of these systems will serve you well. However, with the extra USB port for a cellular modem, the granular control over streaming bitrates and h.264 high profile setting, the larger choice of built-in CDNs, the awesome LRT tech, fantastic battery life, and not one interrupted stream during my testing, the Solo is the best choice when streaming is your number one concern. It’s simply meant for mission-critical streaming in broadcast situations. If I had to choose one portable unit to encode and stay on the air, it would be the Solo. Now, the Teradek VidiU Pro unit is part of a larger, much broader Teradek ecosystem which includes many of their other hardware apps, and their software solution bonding – Sharelink. More web portal control, the ability to record onboard the unit, and make changes from the device make the VidiUPro a great Swiss army knife. But the shortened battery life and interruptions during streaming make the VidiU Pro seem to be a jack of all trades, but a master of none. Have more questions about the LiveU Solo vs the VidiU Pro other than just these 5? Ask me in the Comments section. Also, please subscribe and share this tech goodness with the rest of your techie friends. You can also stalk me online if you’d like, too, I’m easy to find. My thanks to LiveU for their financial support and sponsorship of this episode. The post 5 THINGS: on LiveU Solo vs Teradek VidiU Pro appeared first on 5 THINGS - Simplifying Film, TV, and Media Technology.